As soon Donald Trump took office, his administration started on his primary promise: A crackdown on undocumented immigrants. On his command, the Department of Homeland Security (DHS) widened the dragnet—targeting, essentially, anyone without papers, even if they had not committed serious crimes. The emphasis shifted beyond the border region, with federal immigration authorities using workplace and other raids to round up undocumented immigrants. Young people who were previously exempt from deportation through Deferred Action for Childhood Arrivals (DACA) also became vulnerable, after the Trump administration announced the end of the Obama-era program. So, what has the impact of this aggressive approach been so far? Below are three maps that provide answers. The common theme: Local sanctuary policies that limit cooperation with federal authorities seem to be blunting the force of the administration’s actions. Areas with greater local limitations on federal immigration cooperation have seen, in general, smaller increases in arrests—even if they have large immigrant populations. The first map comes from a recent Pew Research Center report, which analyzed the change in immigration arrests between 2016 and 2017. It finds that between January 20, when Trump took office, and September 30, when the fiscal year ended, Immigration and Customs Enforcement (ICE) arrests went up by 42 percent compared to the same period in 2016. The total arrests in 2017 were also 30 percent higher than the previous year. While these numbers represent significant increases from recent years, they are not nearly as high as in 2009, when twice as many people were arrested. That initial high number in Barack Obama’s first year in office declined over the duration of his presidency, after he shifted policy to focus on deporting particular categories of undocumented immigrants. It’s also important to note that while the Trump administration is arresting more people, it has not yet been able to deport them at Obama-era levels because of immigration court backlog. Pew’s report breaks down 2017’s increases in arrests by geography, showing where ICE has been most effective. The agency operates out of field offices in some major cities that cover not just that particular city, but wider “areas of responsibility” that sometimes span multiple states. All of these areas saw increases in arrests in 2017, but the Miami field office, which covers all of Florida, saw the most—a striking 76 percent increase compared to 2016. Dallas and St. Paul were next on the list, with 71 and 61 percent increases, respectively. (Dallas had the highest absolute number of arrests of all field offices.) New Orleans, Atlanta, Boston, and Detroit followed with more than 50 percent increases. While the concentration of undocumented immigrants certainly drives arrest numbers, it doesn’t completely explain why some areas have had much higher jumps in arrests than others. If it did, immigrant-rich areas near the border, like El Paso and Phoenix, and traditional immigration hubs like New York and Los Angeles, would have all seen much higher increases. What this map suggests is that local policies matter. Miami’s decision to get local law enforcement involved likely helped boost arrests in and around that area, which already has a high concentration of immigrants. The Atlanta metro area has also seen high increases in 2017 for the same reason. Despite former Mayor Kasim Reed’s defense of sanctuary cities, Georgia state law requires cooperation with ICE—and some of the counties around Atlanta have been quite eager to help. The state also has high penalties for driving without a license, which make it more likely for folks without papers to enter the criminal justice system, and then, the deportation pipeline.There is at least some indication that the Trump administration is trying to have the opposite effect, instead targeting those jurisdictions that have more protective local laws. In September 2017, ICE, focused their raids in localities and cities that have sanctuary policies, saying that the agency was “forced to dedicate more resources to conduct at-large arrests in these communities,” because of these policies. Later, ICE’s director also suggested that the politicians from these cities should face criminal charges for harboring undocumented immigrants. But so far, the effect of that laser focus is unclear—it’s certainly not visible in the aggregate data used for the Pew map. Local politics have also shifted in the last year, in response to the national immigration agenda. 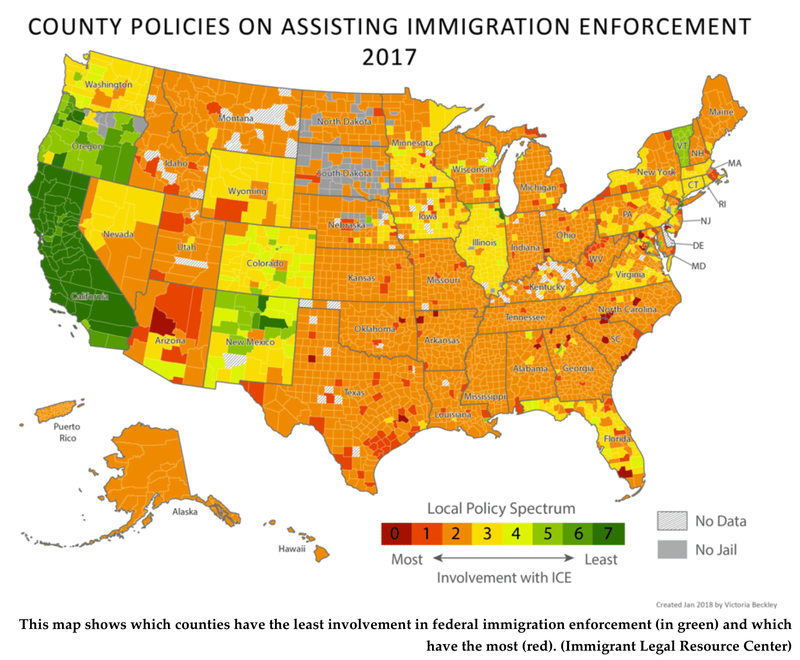 The second and third maps show the current county-level sanctuary policies—and how they have changed since Trump took office. 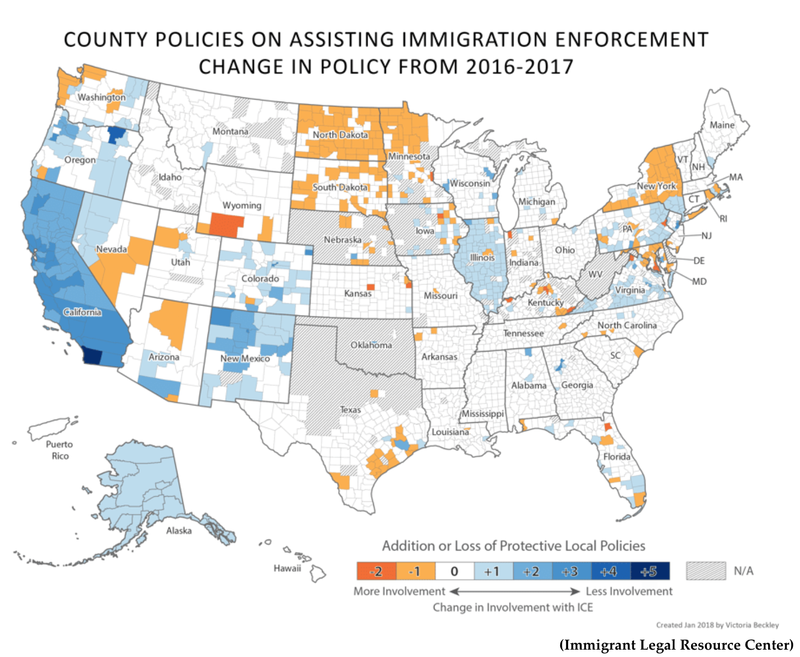 Both come from a new report by the Immigrant Legal Resource Center (ILRC), an immigrants’ rights organization that has been tracking how involved localities have been in immigration enforcement. ILRC legal researchers created these rankings based on a seven-point rubric that reflects the spectrum of existing sanctuary policies in 3,000-plus counties. They included policies that limit the use of municipal resources for immigration enforcement, that forbid police from collecting information about immigration status, that ask police to decline ICE’s warrantless requests to detain individuals for extra time, and others. They also looked at whether these localities had agreements with ICE (called 287(g) agreements) to deputize their police officers to do various immigration enforcement duties.ILRC also traced the changes in these policies. And what they noticed was that as the Trump administration doubled down on curbing illegal immigration, some local governments started joining the effort, while others started mounting resistance. According to ILRC’s analysis, 410 localities strengthened sanctuary policies in 2017 (in blue below). Many did so in more than one way. Denver County, Colorado, for example, enacted a law in 2017 that forbids city funds or resources going towards investigation or detention of undocumented immigrants—in the absence of a judicial warrant. It also rules out 287(g) contracts. A quarter of the counties have now put limits on how their police respond to ICE’s “detainer” requests, up from just a handful in 2013. These demands to detain individuals that the federal agency suspects are undocumented for longer than their sentence have been ruled illegal by severalcourts. Overall, though, around 74 percent of the counties continue to help ICE out in whatever way it asks, “often without even analyzing whether it is legal to do so,” the report notes.